I don't really like to criticize Neil Patrick Harris because I am in love with Neil Patrick Harris. I don't know how you can watch NPH do anything and not fall madly in love with him, and his husband David Burtka, and their twins, and the life they've built together. If you can manage to avoid it, you must not be human. However, I have to lay the blame at NPH's feet for the reoccurring joke with Octavia Spencer during the 2015 Oscars on Sunday. The gag was that Harris had made all of his Oscars predictions in advance and locked them in a box, which he then asked Spencer to keep an eye on until the end of the ceremony. She was instructed not to get up, or eat, or even pee for fear that someone might make away with the box in her absence. And Harris continually checked to make sure she still had her eye on the box a couple of times during the ceremony. My question is why? Why Octavia Spencer? It was a hard pill to swallow from a ceremony that is so outrageously lacking in diversity that Harris' first "joke" of the night called out the whiteness of the Oscars this year, and there is an entire hashtag devoted to this same lack of diversity. (#OscarsSoWhite, for those who missed the boat on that one.) There was nothing horrifically offensive about Spencer's role in the ceremony, and certainly it gave her more airtime than her short presentation later into the program, but the way they went about it just sat wrong with me. 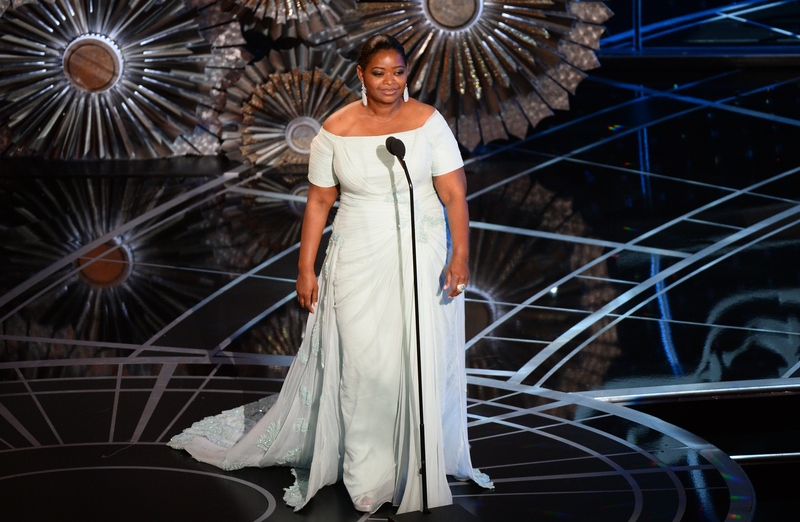 There were so many other ways to involve a woman of color more deeply in the showmanship of the ceremony. Why have her watch a locked box for three hours as a gag? Even as I type this, I know I can easily be accused of taking a gag too seriously, but the purpose of the gag is lost on me. I started out the ceremony thinking that this was a way to give Spencer some time to shine despite Harris being the actual host of the show — much like Anna Kendrick performing the opening monologue alongside him. Instead, every time Spencer was put into the spotlight as far as that box was concerned, it was in an unflattering light. When asking her to watch the box to begin with, there was a gag about how she was not allowed to take her eyes off of it even for snacks. Gamely, Spencer pretended to be very upset by this command. Because, you know, who doesn't love snacks? The next time he checked in with her to make sure that she was focused on her task, Harris commanded her to eschew bathroom breaks in order to watch the case. He even asked, "Is your bladder full?" To this question, Spencer shook her head with mock seriousness. (Yes, this was a real joke that happened.) The third time, he acted horrified to see her missing before he realized that she was coming on stage in order to do her presentation. That presentation was her best moment of the night, to be honest, on a night where we got to see plenty of focus on her. It's just that that focus was for the wrong reasons. Kendrick was involved in an extended showstopper with Harris, while Spencer was relegated to the role of a snack addict who was allowed no bathroom breaks when she had a Very Important box to watch? Is this a real thing that happened? And why? I understand that it's just a joke, but it was a strange joke for the Oscars to make when they are already facing so much backlash due to the lack of diversity in the 2015 ceremony. To involve a woman of color in that ceremony, only to use her as a punchline with a fake, useless task, just left a bad taste in my mouth. Spencer is a BAFTA, Golden Globe, SAG, Critics' Choice, and Academy Award winning actress. Surely, there had to be a better place for her in the award show than that. At this point, it really doesn't even matter what's actually in that box — whether it's truly NPH's predictions or some other surprise that makes all of this build up worth it. This is one Chekhov's gun that I don't want to follow to its natural conclusion, because the journey there was just too painful. Hopefully, next year, the Oscars will know better than to make jokes like this one.